Cornelius Castoriadis was born in 1922 in what was then known as Constantinople and would soon become Istanbul. In the troubled times surrounding the birth of the modern Turkish State, Castoriadis's father, a Voltairean Francophile of Greek extraction, removed the family to Athens. There the young Castoriadis grew up during the turbulent years leading up to the Metaxas dictatorship, the Second World War, the Nazi occupation, Greece's liberation, and the Greek Communists' December 1944 coup d'État attempt. In December 1945, under threat of death from both Fascists and Stalinists, Castoriadis, who had joined the Greek Communist Youth only to enter soon thereafter into opposition and then join the Trotskyists, departed from Piraeus for Paris. In Paris he founded with Claude Lefort the now legendary revolutionary journal Socialisme ou Barbarie (1949-1965), to which Jean-François Lyotard also once belonged. The group by the same name is now generally credited with inspiring the May 1968 student-worker rebellion; French student leader Daniel Cohn-Bendit, for example, who appears in the Reader as Castoriadis's cospeaker at a 1980 ecology conference, proudly proclaimed in 1968 that he had largely "plagiarized" Castoriadis's and S. ou B. 's views. Today Castoriadis--renowned "Sovietologist," retired OECD economist, practicing psychoanalyst, and innovative philosopher--is considered one of Europe's foremost social thinkers. He still lives in Paris, where he continues to develop his political "project of autonomy" and his philosophical ideas on the "imaginary institution of society." I shall not offer the reader of this Foreword an in-depth analysis of Castoriadis's views or a detailed biography of this author. The Castoriadis Reader has itself been designed to acquaint readers new and old with both him and his work. Rather, I shall briefly explain here my choices for this Reader as way of introducing its contents and highlighting its potential significance. A Reader, as I conceive it, should serve a variety of purposes. With the author's assistance, I have endeavored to respond to these multiple requirements and I hope to have fulfilled them as editor of this Reader. A first purpose is to provide a general overview of the author's work instead of concentrating on just one or a few topics or periods. The texts presented here start, after the introductory interview in Chapter 1, with the 1949 "Presentation" of the first issue of Socialisme ou Barbarie and end with some of Castoriadis's most recent writings. The Reader's fifteen chapters also encompass most of the major themes of his life's work, including: workers' management and people's potential for creative and autonomous self-activity; the early, radical, and ever relentless critique of the erstwhile "Union of Soviet Socialist Republics" ("four words, four lies," Milan Kundera once quoted Castoriadis as quipping); the "positive content of socialism" and the economics of a self-managed society; the critique of the conservative and capitalist elements found in Marxism and the development of the idea of the "imaginary institution of society"; ecology and the present dangers of an out-of-control, autonomized "technoscience"; the "crisis of Western societies" and the current waning of contestation on the levels of both philosophical thought and political action; the inspiration the author has drawn from ancient Greece in general and the Greek polis's simultaneous creation of philosophy and politics in particular; the elucidation of an alternative logic to the traditional "ensemblistic-identitary" one that has ruled Western "inherited thought" for the past twenty-five centuries; the role of cultural creation in the process of democratic social transformation; and the contribution a properly understood and practiced psychoanalysis can make to both philosophy and the project of autonomy. A Reader must also offer, in some sort, a series of "greatest hits" if readers are to familiarize themselves with the author's major works. In Castoriadis's case, not all the classic texts could be presented in their entirety in a one-volume Reader. We therefore had to make choices among them and provide excerpts from some of those we did eventually choose. A reader already familiar with Castoriadis's work will note, and perhaps lament, the absence of such key writings as "Socialism or Barbarism" (1949) and "Modern Capitalism and Revolution" (1960-1), which could not be included; but in these two cases other classic texts--the Presentation to Socialisme ou Barbarie, "From the Critique of Bureaucracy to the Idea of the Proletariat's Autonomy" (1955), and "Recommencing the Revolution" (1964)--serve to summarize many of the absent articles' main points. Also, the reader may be heartened to learn that other classics--such as the second part of "On the Content of Socialism" (1957), The Imaginary Institution of Society (1964-5; 1975), and "The Greek Polis and the Creation of Democracy" (1983)--have at least been presented in the form of excerpts. First-time readers will thus be able to familiarize themselves with the author's main ideas by reading some of his most important and best known writings. A Reader can also present hard-to-find texts for the benefit of both the first-time reader and "old timers," those who have followed Castoriadis's contributions to the revolutionizing of thought and society over the past five decades. We have thus also selected a number of lesser known pieces that were previously published in English only in small academic, political, literary, or arts journals. These texts include "The Social Regime in Russia" (1978), "From Ecology to Autonomy" (1980), "The Logic of Magmas and the Question of Autonomy" (1983), "Culture in a Democratic Society" (1994), and "Psychoanalysis and Philosophy" (1996). Many people, however, pick up a Reader in order to familiarize themselves quickly with the basics of an author's thought. Several chapters of this Reader offer programmatic accounts of Castoriadis's main topics of discussion: "Recommencing the Revolution," "The Social Regime in Russia," and "The Logic of Magmas and the Question of Autonomy" respond to this desire for succinct thematic statements by presenting his views in the compact and ordered form of numbered theses. These three summary texts, along with many of the others, also refer the reader to additional writings by the author where his arguments were developed for the first time or in greater detail. This last point suggests one further purpose a Reader can and, indeed, should serve: to provide a historical overview of the evolution of the author's views. Theses presented in summary, or even canonical, form, and without additional reference to where these ideas were first developed and were subsequently refined, revised, or altered in response to criticism, would provide the reader with a skewed and contextless idea of the author's intellectual and political life. Therefore, with the exception of the introductory first chapter and the final one (which features responses to critics), the texts have been organized in chronological order. This chronological ordering, along with the addition of a myriad of abbreviated references in most texts, goes far toward eliminating for the reader this potential danger. A guide to the abbreviations used appears directly after this Foreword and the Acknowledgements page. But even when a Reader answers to these varied purposes and avoids the above-mentioned danger, the reader might not yet get a clear sense of what the author really has wanted to say. Indeed, when one reads a Reader of some no longer living author one may still, even with the sense of closure afforded by that author's death, lack a sense of the whole, an understanding of what the author lived for and was willing to die for. As the present Reader is a collection of texts by a writer who is still very much alive, still very active, and still developing and deepening his thought, we are fortunate to have "Done and To Be Done" (1989), a recent example of Castoriadis debating with his critics, extending his thinking, returning to previously covered ground in order to work it over once again. This final chapter contains the author's forceful and thoughtful replies to thirty discussions of his life's work which were written by an international collection of scholars. 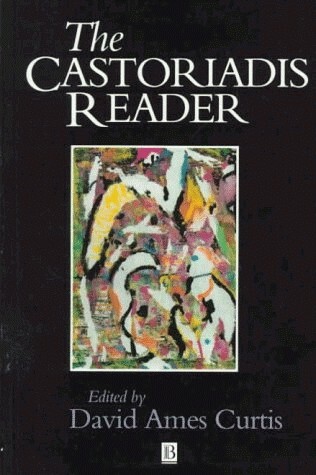 (1) Here we witness Castoriadis at his polemical and critical best, responding to objections, clarifying his positions, exposing misinformed or misguided assumptions held by critics, and developing his ideas and projects even further in a variety of directions while making frequent reference to his own past writings, including many of the texts presented here unabridged or in excerpts. No doubt, "Done and To Be Done" will whet the appetite of many a reader who will then desire to read other writings by the author. I believe the present volume provides readers with the necessary background for such further explorations and the necessary basis to make something meaningful of them. I do not wish to prescribe in advance for readers the ways in which they are to evaluate and judge the innovative ideas contained in this last chapter, or the Reader as a whole; I hope--indeed, I am sure--that some readers will invent fresh responses and insights of their own, ones that no one has thought of before. Let me, in anticipation of the reader's own work, focus merely on one recent notion from "Done and To Be Done" which I consider particularly fecund. I wish to highlight this notion also because Castoriadis makes specific reference there to "On the Content of Socialism, II," a text I was determined to include in this selection from his fifty years of political, social, and philosophical writings. As Castoriadis's English-language translator/editor, I am often asked by the more politically-minded of his readers whether he still holds to the vision of a self-managed society as outlined in this 1957 article. In contrast, others less interested in his radical political positions than the more recent developments in his social, psychoanalytical, or philosophical thought might simply view this forty-year-old text as outdated and perhaps not worth the bother of including in the present Reader. There are, however, as I have argued elsewhere, (2) a continuity and coherency to his life's work that authorizes and, indeed, enable one to present his writings as a still relevant and evolving whole. In "Done and To Be Done" Castoriadis states his conviction that the spirit and principles of CS II remain valid, except for its (relatively) exclusive workerism and the obsolete notion of the "dictatorship of the proletariat." For him, socialism--or what he now calls the "autonomous society"--must involve the socialization and democratization of the management of the economy (as opposed to its mere "nationalization," with exclusive control over "production" and "planning" delegated to a separate stratum of bureaucratic managers), but also the socialization and democratization of society itself. (3) In contrast to all major schools of Western political thought with the sole exception of anarchism--from the libertarian "minimal State" to Communism's extreme inflation of the State's role (on the factual, if not ideological, level)--Castoriadis argued in CS II, and still argues today, for the elimination of any stratum of rulers separated from the real life of society, any party or other instituted group that would claim responsibility, in society's absence, for society's overall orientation as well as for its specific doings and expressions. As he has stated many times, such a project is in head-on contradiction with totalitarian pretensions to eliminate the private and civil spheres of action or to absorb these spheres entirely into the State, or with other attempts to limit or circumscribe, from the outside or through extrasocial representations of society, people's freedom to contribute to the making and remaking of society--just as the direct democratic inspirations of this project stand in stark contrast to modern liberal-oligarchical compromises and to the not-even-half measures most post-totalitarian "political philosophers" today are falling back on. As an analytical concept, he explains, this "public/private" sphere may be applied to any society. It is a free agora open to all, one in which everybody would have an equal effective possibility of participation, whose instauration (5) Castoriadis would be aiming at achieving. (6) This would be an agora that has emerged from the oikos, as occurred for the first time in Ancient Greece--Hannah Arendt, too, identifies Greece as the birthplace of a "public space"--but which would not be so identified with the public/public sphere, or so far removed from it, that it would have ceased to be an independent and genuinely private/public entity. Castoriadis is thus developing a conceptualization of social and political organization that clarifies, but also challenges, the binary civil society/State distinction now being much heralded again by formerly radical critical thinkers from both the West and the ex-dissident East who have decided to make their peace with a State whose existence they no longer challenge politically or even on the level of thought. Today, we should recognize, the agora as commercial market is becoming little more than a privately owned and operated shopping mall, (7) or perhaps a home shopping network for the world's plugged-in agoraphobes. And, as financial market, it is being transformed more and more into a "planetary casino," Castoriadis has remarked, where the amounts placed into worldwide electronic speculation every few days equal the U.S. GNP. The classical sovereign nation-State is thus itself becoming irrelevant and impotent as the world rapidly coalesces into supranational, superregional trading blocs whose main purpose and passion is neither to foster direct democratic input nor to address the festering and even worsening problems of environmental degradation. Nor do either the traditional nation-States or these new superregional groupings appear particularly adept at facing up to the rise of religious fanaticisms and various deadly forms of separatist nationalism, communitarianism, and ethnic mania, their responses being mostly half-heartened, reactive, belated, and often counterproductive in the long run for lack of any meaningful and mobilizatory project of their own. Nevertheless, in aiming at the creation of the conditions under which this public/private sphere might emerge, (9) independently from and in solidarity with the two other spheres Castoriadis is describing, a problem immediately arises. "The first condition for the existence of an autonomous society--of a democratic society--is that the public/public sphere become effectively public, become an ekklesia and not an object of private appropriation by particular groups," Castoriadis argues in "Done and To Be Done." In the contrary case, one would end up with neither the private/public sphere nor the private/private sphere being free and independent; both would be mere objects of publicity, of mystification, of manipulation and brute force, and/or the expression of a generalized conformism toward fashion and authority, as is presently the case to a very high degree. But if such is the "first condition," and if this condition is to such an extent absent in the present state of society (which does not mean that we should cease to favor its implementation or that we should believe people collectively incapable of launching an effort, even today, toward its realization), why then aim at the creation of any other conditions for the eventual emergence of the public/private sphere as part of a future autonomous society? To wait for the first condition to be duly and completely fulfilled before doing anything else would be equivalent to renouncing all present efforts toward encouraging reflection and self-responsibility; all liberatory educational endeavors, whether formal or informal; any attempts by people, inspired by psychoanalytic practice or just mutual discussion and reflected experience, to engage in criticism/self-criticism and to confront lucidly their present problems or oppression as they come to define them. It would amount, in short, to an abandonment of all not explicitly political forms of praxis, in the sense Castoriadis intends the latter term: activities that aim at the autonomy of the other and of oneself (see "Marxism and Revolutionary Theory" and "Done and To Be Done"). Despite the fact that such renunciation seems to be in our day the prevailing "norm," we ought to refuse to give in on this point. Furthermore, to concentrate exclusively and unilaterally on this first condition relating to the ekklesia in such a way as to prevent oneself from undertaking any action or reflection whatsoever in the other two spheres would be equivalent to ignoring the solidarity and the mutual implications between these three spheres of social life, their circle of continued creation. This is equally the reason why we ought not to aim merely at reinforcing a "civil society," or building a "civic forum," alongside a State Apparatus that is left standing--even a "democratized" and now "lustrated" one, as in the case of the Czech Republic. (10) In taking as our goal an autonomous society--whose "first condition" remains the instauration of a genuinely public ekklesia--the emancipation of the agora and the development of the capacity for critical reflection and deliberate action in the private/private sphere become indispensable co-aims. Indeed, "to guarantee the greatest freedom possible" among these three spheres, all the while expressing and emphasizing their mutual solidarity and reciprocal responsibility, becomes the key imperative for such a society, Castoriadis says in "Done and To Be Done." Still, we are immediately confronted with innumerable questions. We ought, for our part, to reject all forms of nationalism as an inappropriate biological figure for an autonomous social collectivity that should come to know itself as such and in its various social articulations; that is, we ought to reject nationalism as the allegedly natural (or even "naturalized") self-substitute for the properly social sphere. But how can we aim at an international or transnational (or, better: forthrightly non-national) agora in the absence of an international demos and in the face of today's widespread and growing nationalist and religious motivations and sentiments of internal exclusiveness and external exclusion? The whole question of revolutionary social organization, (11) as well as that of the struggle against all forms of mystification--both of which are addressed in the 1974 introductory interview--arises anew; and this, in an persistent and radical way. Faced with such questions, those who wish to engage in finding responses can take their shared activity of posing these questions and of seeking answers to them as a common field for creative reflection and action. In this work, originality, relevancy, exemplariness, (12) and a desire to share and scrutinize personal and collective experiences without essentializing these experiences or placing them somehow beyond the reach of criticism can become watchwords. It is my hope that this Reader will aid those still attracted by such aspirations to give them concrete expression. 1. I am guest editing a special issue of Thesis Eleven, which will present additional critical appreciations of Castoriadis's work, along with new texts by Castoriadis himself, on the occasion of his seventy-fifth birthday in 1997. 2. See my Foreword to the first volume of Castoriadis's Political and Social Writings and, especially, my Foreword to his recent book, World in Fragments. 3. To speak of the "socialization of society" might appear redundant to some--and impossible to others. But Castoriadis has been highlighting the phenomenon of the privatization of society since the 1960s (see MCR) while also endeavouring to show that there is no incoherency or impossibility in the goal of encouraging "instituting society" to have a conscious, concerted, and continuing effect upon "instituted society" (see MRT [1964-5]). Not, too, that I did not say "socialization and democratization of the State." A few years ago, at a Paris lecture given by Richard Rorty for which Castoriadis served as respondent, Chantal Mouffe called for a "debureaucratization of the State"; Castoriadis aptly quipped that this would be like calling for a "demilitarization of the army." 4. Not that the latter should be considered sacrosanct, or even a "haven." Castoriadis develops further his ideas on the three spheres of social and political life in a recent text, "Democracy as Procedure and Democracy as Regime," forthcoming in Constellations, the successor review to Praxis International. 5. As I noted in the Glossary to the first volume of Castoriadis's Political and Social Writings and in World in Fragments's "A Note on the Translation," I have revived the original meaning in English of "instauration," which is to establish something anew or for the first time. I have not developed another glossary or translator's note for the Reader; instead, I have, more frequently than in my other volumes of translations of Castoriadis's writings, indicated in brackets the original French word or phrases whenever some ambiguity might be alleviated or a meaning might be clarified. 6. In some cities in ancient Greece, Aristotle notes in the Politics, the agora--not as market-place but as site of discussion, reflection, and deliberation--was reserved for only a portion of the polis's citizens, others being excluded therefrom. 7. Characteristic in this regard is the US Supreme Court ruling that refused to guarantee the exercise of First Amendment rights in privately owned shopping malls across the country. So much for the alleged compatibility or mutual implications between democracy and capitalism--whose mutual incompatibility we already recognized clearly in the capitalist workplace. 8. As I noted in the Foreword to Cleisthenes the Athenian (Atlantic Highlands, New Jersey: Humanities, 1996), my translation of Pierre Lévêque and Pierre Vidal-Naquet's classic 1963 essay on the reforms that led to the birth of democracy in Athens (Castoriadis appears there as a participant in a subsequent discussion that was printed as a supplement), a curious new phenomenon is the call by the 1992 presidential candidates William Jefferson Clinton and H. Ross Perot for a revival of the town meeting format, whether televised or "electronic"--and this, in the absence of any widespread demand on the part of the populace for the use of such organs of public policy formation or ratification! In view of the lack of serious thought given to the formulation of these proposals and in the light of the character of the politicians advancing the idea, we should certainly avoid concluding that elite leadership groups or individuals have suddenly become gripped with a passion for direct democratic participation. Rather, as I argued in that Foreword, extending Castoriadis's ideas on the "bureaucratic-capitalist project" (with its simultaneous need to exclude people from participation and to encourage such participation), we should see these proposals for what they really are: rather desperate and ill-thought-out attempts to come to terms with the ongoing depoliticization and privatization of society, where people's absence of involvement, itself mandated by the present system, inevitably leads to dysfunctions in the operation of that system which the system is obliged to address. Were we to borrow medical or psychoanalytical language to describe it, we would call this social and political phenomenon--like that of "quality circles"--a signification symptom of something that clearly goes far beyond its explicit content and certainly bears further examination. 9. Its emergence, of course, could in no way be merely an illustration of any particular person's ideas. There is not, and I trust that there never will be, any "Castoriadianism." 10. "Civic Forum" was the name of Vaclav Havel's opposition group which led to the overthrow of the Communist regime in Czechoslovakia. A forum is not an agora. 11. Recently I read that Jacques Derrida, in his book on the "spectres of Marx" after the fall of Communism, calls for the creation of a "new International"--one that would not be burdened, however, with any "institutions," these presumably being intrinsically bad and, apparently, perfectly avoidable for an earnest cynic like Derrida. Inspired in great part by Castoriadis's work, Vassilis Lambropoulos in the third and final chapter of his book The Rise of Eurocentrism: Anatomy of Interpretation (Princeton: Princeton University Press, 1993) has developed many of the elements for a coherent and consequential critique of Derrida's deconstructionist errings. 12. There is a constant--and ineliminable--tension between excellence and commonality in a democracy society, fraught with risks but also pregnant with inspirations and hopes.